Isia KHALFI provides advisory and litigation services in various areas of business law. She assists our clients in their cross-border transactions, in drafting and negotiating commercial contracts, creating and developing franchises as well as financing. With her international training and her fluency in English, Isia holds a particular expertise in assisting our French and foreign clients in their international development. Before joining the firm in 2016, Isia worked in the Silicon Valley for start-ups and a law firm which specializes in legal assistance to start-ups. 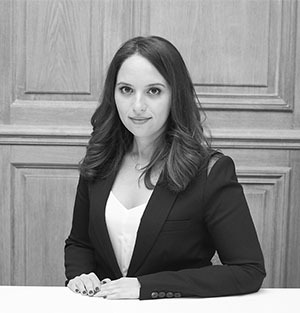 A member of the New York Bar and of the Paris Bar, Isia KHALFI holds a Masters Degree of Bilingual studies European Law, French law and English and American law speciality, as well as an U.S. Legal Studies LL.M from Golden Gate University, San Francisco. She joined the firm in 2016.